With Republicans winning a majority in the U.S. House of Representatives on a wave of anti-government sentiment, the political focus in Washington has turned to government spending and deficit reduction. Yet while most Americans agree that deficit reduction should be a top priority this year, it is not universally seen as the most pressing economic problem. In particular, since the impact of the recession was not felt evenly across the typology groups, those who are still struggling to get back on their feet see the job situation and inflation as bigger concerns. And there are even more substantial gaps over how deficit reduction should be pursued, both across party lines as well as within the partisan coalitions. On the right, there is an alignment of opinion between Staunch Conservatives and Libertarians that deficit reduction is the priority, and dramatic cuts, including changes to entitlement programs, should be the focus. But Main Street Republicans are less enthusiastic about these changes, and more willing to see tax increases included in a plan to reduce the deficit. Disaffecteds, who were a critical factor in the 2010 GOP gains, are even more deeply skeptical of deep spending cuts and entitlement reform, and both Main Street Republicans and Disaffecteds see little difference between the Republican Party and Obama when it comes to offering a deficit-reduction plan. On the left there is more consensus that jobs and prices are a bigger worry than the deficit, with Solid Liberals, in particular, expressing the view that deficit reduction is not a top public policy priority this year. And while Democratic-oriented groups tend to agree that any deficit solution will need to include a combination of spending cuts and tax increases, they differ over whether the cuts should focus on domestic or defense spending, and how willing they are to see taxes rise. One stand-out group is the Democratic-leaning Post-Moderns, who are far more supportive of across-the-board spending cuts than most core Democratic groups, and see little difference between Obama and the GOP in terms of who is offering the best approach to the issue. While most see addressing the deficit as a top priority, concern about jobs and prices remains more widespread among the general public. In fact, only among Staunch Conservatives and Libertarians do even half rate the budget deficit as the economic issue that worries them most (50% and 49%, respectively). While 34% of Main Street Republicans rate the deficit as their top concern – which is higher than the national average – about half cite either jobs (24%) or rising prices (26%) as their top concern. Not surprisingly, given how hard they were hit by the recession, Disaffecteds are mostly concerned about the job situation (43%) and rising prices (36%) – just 9% cite the deficit as their top concern. Similarly, nearly as many Hard-Pressed Democrats say the job situation (33%) worries them most as say rising prices (42%). 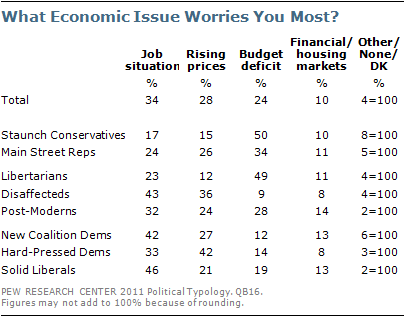 New Coalition Democrats and Solid Liberals are more worried about the job situation than other national economic issues (42% and 46%, respectively). Nearly two-thirds (64%) of Americans say that the best way to reduce the federal budget deficit would include a combination of both cutting major programs and increasing taxes. 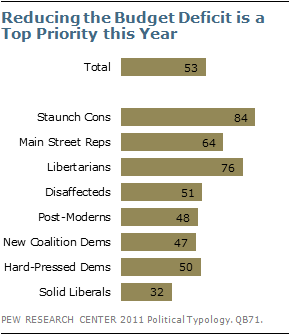 Just 20% say the focus should be mostly on spending cuts, and just 6% say it should be mostly on tax increases. Staunch Conservatives are the only group where a majority (59%) says the approach to deficit reduction should focus mostly on cutting major programs. Nearly half (47%) of Libertarians agree that spending cuts should be the focus, while about as many (45%) think a combination of cuts and tax hikes are in order. Clear majorities in all other groups say the best way to reduce the deficit is through a combination of cutting major programs and increasing taxes. At the other end of the spectrum, the only group where a substantial number want to see a focus on tax increases is Solid Liberals. But even here only 23% are of this opinion, while 70% believe a combination of spending cuts and tax increases should be the focus. While most Americans are willing to accept that tax increases may need to be part of a successful deficit reduction strategy, few explicitly favor tax hikes when offered as a specific option. While 61% of Americans favor lowering domestic spending as a way to reduce the budget deficit and 49% favor reducing defense spending, only 30% say they are in favor of raising taxes to reduce the deficit. And changes to Social Security and Medicare are equally unpopular (30% favor). The ideological ends of the typology have strong opinions about deficit reduction. Staunch Conservatives overwhelmingly favor domestic spending cuts, and nearly half favor changes to entitlement programs as well. And they are overwhelmingly opposed to cutting defense spending and raising taxes. By contrast, Solid Liberals overwhelmingly favor defense cuts and tax increases, and oppose changing entitlements and cutting domestic spending. 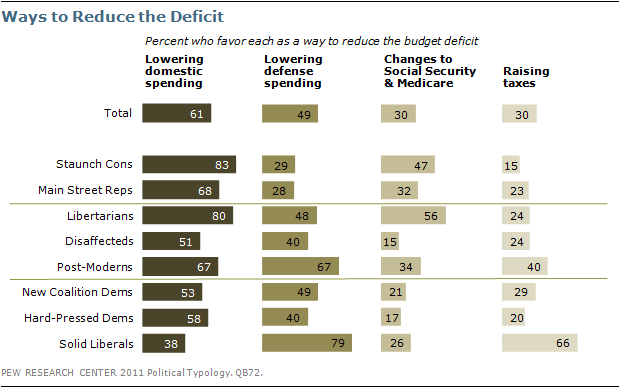 Beyond these ideological extremes, there are widely diverse views on deficit reduction strategies. In keeping with the priority they place on the issue, Libertarians are open to nearly all approaches, except tax hikes. They align with Staunch Conservatives on domestic spending cuts (80% favor) and changes to Social Security and Medicare (56% favor), but nearly half (48%) also support cuts to defense spending. Main Street Republicans are substantially less committed to some of the GOP deficit reduction strategies – with 68% backing domestic spending cuts and 32% in favor of changes to entitlements. Post-Moderns, too, back a relatively broad array of deficit strategies. They are the only group in which a majority backs both domestic and defense spending cuts (67% favor each), and a relatively high 40% favor increasing taxes as well. On the left, both Hard-Pressed and New Coalition Democrats differ substantially from Solid Liberals in how they would like to see the deficit addressed. More than half of each supports domestic spending cuts, which a broad majority of Liberals oppose, and conversely where Solid Liberals overwhelmingly favor tax increases, both other Democratic groups overwhelmingly oppose this. And reflecting their economic stress and the low priority they place on the issue, Disaffecteds offer relatively little support for any of the deficit reduction strategies tested compared with the general public. Who Has a Better Approach? The prevailing view, held by 52% of Americans, is that neither Obama nor Republicans in Congress have a clearly better approach to dealing with the federal budget deficit. The survey was conducted before the mid-April shutdown debate and before the release of deficit reduction plans by Rep. Paul Ryan and President Obama. This is the opinion not only of predominantly independent groups like Disaffecteds and Post-Moderns, but also the view of 57% of Main Street Republicans and 63% of Hard-Pressed Democrats. 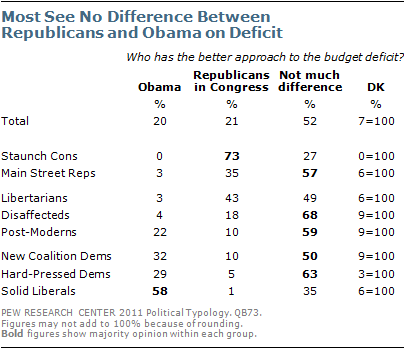 On the right, only Staunch Conservatives clearly believe the Republican approach to deficit reduction is better (73%). Many Libertarians (43%) agree, though they are equally likely to say there is no difference (49%). 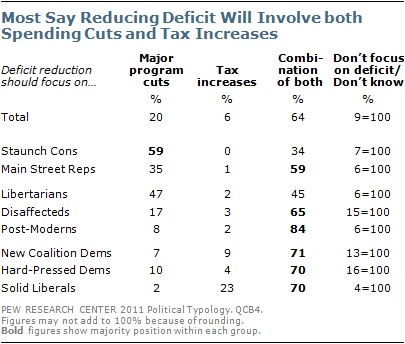 On the left, only among Solid Liberals does a majority (58%) say Obama has the better approach to deficit reduction. By roughly two-to-one (34% to 18%) more Americans think making major cuts in government spending this year would hurt, rather than help, the job situation, with another 41% saying spending cuts won’t affect jobs. Only Staunch Conservatives are more likely to say that spending cuts will help the job situation than hurt it. 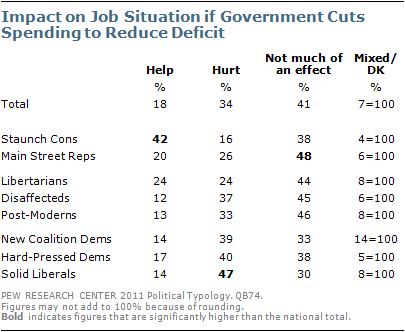 By contrast, Solid Liberals are the only group where a plurality says that spending cuts will hurt the job situation. But Solid Liberals are not the only ones to think that, if there is an effect, spending cuts would do more harm than good with respect to jobs. Among both Hard-Pressed and New Coalition Democrats, as well as among the predominantly independent Post-Moderns and Disaffecteds, at least twice as many say major spending cuts will hurt the job situation than say such cuts will help.